The cellar is pretty quiet right now, and cold, too. At this time, we’re monitoring malolactic fermentation in many of the barrels. Malolactic fermentation is a process during which tart-tasting malic acid (which occurs naturally in the grapes) is converted to milder-tasting lactic acid. It’s a slow process, currently, because of the cold temperatures, but that’s okay. When temperatures are cold, there’s little opportunity for microbial effects to take hold, so there is a benefit to the current weather. We have lots of bottling planned for early March. We will bottle our 2017 Pinot Noir, 2017 Sidecar – Off The Wagon, 2017 LÜK Gamay Noir, and a 2017 LÜK Petite Sirah. I am especially excited about the Petite Sirah. This is a new wine for us; it’s very different than what people expect from us, stylistically. This is a very different wine grape than the others with which we’ve worked. It’s deep, dark, sensuous, and full-bodied. It’s a variety I’ve always found quite interesting. It is big and bold, and that’s what it’s known for, but I do believe it can have an existence outside of that, with more dimension. This project came about because I connected with a new Rogue Valley vineyard, in Oregon. It had recently acquired land, which had been planted with Petite Sirah 15-20 years ago. It’s a small lot of Petite Sirah, so I jumped at the opportunity. Additionally, I connected with Crater View Vineyard, also in the Rogue Valley, in order to source some Petite Sirah to use for a single-vineyard bottling. Crater View also grows Roussanne, so I co-fermented a small lot into the Petite Sirah. This is a classical red-wine technique that uses the white wine grapes to give more aromatics and to lighten the tannic tone a little. This is the additional dimension I spoke about earlier. I hope others find excitement in this new offering – we don’t have much longer to wait. What’s My Interest in Gamay Noir? Gamay Noir is new to some people who’ve had a true appreciation for the Beaujolais style of Gamay, and also for people who tried but didn’t especially care for that style. The Beaujolais style is bright, juicy and fresh and is the lighter side of what the Gamay wine grape can become. At an almost polar opposite of this style is what I think of as the Grand Cru of Gamay, which is made in a Burgundian sense, is more serious, and can age as long as a Grand Cru Burgundy. Personally, I feel a real winemaker kinship with this variety; it’s so different than the others that are grown in Willamette Valley in that it’s the last one we bring in during harvest. It takes a long time to get ripe and the natural environment of the Valley is very good for this grape. I sense a growing, underlying momentum for Gamay Noir and think we’ll all hear more about this variety as Willamette Valley develops. LÜK was a brainchild of mine; I always intended to work with more varieties than Pinot Noir. Since my intent has always been to keep Aberrant Cellars exclusive to Pinot Noir and for each of my brands/labels to have its own unique identity, I began to develop the concepts of additional brands and labels that I could bring to the market. I decided to adapt the style of LÜK to be more modern-edged than Aberrant or Sidecar. The mouth feel is a little different in that the textures are more polished and more focused on developing the gentle side of the wines. These wines are more fruit focused and will be more approachable at the onset of their release. We recently released our 2017 Chardonnay and our 2017 Gamay Noir. They were both sourced from the Havlin Vineyard in the Van Duzer Corridor AVA of the Willamette Valley, in which there was a cool, long growing season. The Chardonnay is a unique, Chablis-minded style, with bright focus and approachability. I wanted it to have a restrained, balanced style, which is what I believe Willamette Valley naturally lends to the Chardonnay grape. The Gamay Noir, as described above, is fresh and bright but has weight and will cellar well. I do not expect that Gamay will approach or exceed the popularity of Pinot Noir in Willamette Valley, but I do believe we’ll see more of these wines from this region. The 2016 Off The Wagon was a Claret that did not contain any Gamay. There was very little Gamay available in 2016, so although the 2015 blend did contain Gamay, 2016 did not. For 2017, Off The Wagon is a Rogue Valley Claret-minded blend (Claret is a French term that describes a Bordeaux-type blend). The blend consists of Cabernet Sauvignon, Malbec, Carménère and Cabernet Franc. The wine has a beautiful coffee-ground scented nuance, which comes from the Carménère. The tannins are well-balanced and the wine has been very well received, so far. It is delicious with grilled meats, it will drink really well right now, and it will continue to get better with age. So far, it’s been very popular with consumers who know Bordeaux blended wines. Carménère is unique by Oregon standards, in that it grows really well here because Rogue Valley is so similar to Chile with its high elevation and cool evening temperatures. On paper, the comparison between the regions seems obscure, but they are naturally similar and there is a real opportunity to grow more here. At the beginning of October, our harvest was at about its mid-point, (maybe the 6th inning, in baseball terms). It is a glorious vintage so far; we had a warm, dry year but it was never extreme. There is a lower yield than 2017, and the fruit is more fresh and concentrated. I see excellent potential for very high quality wines. There were no signs of mold or disease this year; it was a healthy crop. September cooled and delivered just a little rain to give the vines a reprieve from the last stretch of sun. Temperatures moderated toward the end of the season so the grapes had good hang times. This allowed vintners to really hone in on timing the harvest just right, with no pressure from Mother Nature to hurry up. I’m eagerly anticipating working with this fruit. Since our grapes come from two regions, I’ll discuss the north and the south separately. Overall, the 2017 harvest was a very successful one for us. The grapes that we received from our northern vineyards, in Willamette Valley, arrived about two weeks later than average. Some were even a little bit later than that. The exception to this was the Chardonnay, which was the first variety that we pulled in this year. It arrived at our winery on September 30. This is our first time working with Chardonnay. It’s from Havlin Vineyard, located in the AVA of Van Duzer Corridor, in central Willamette Valley; and, we plan to bottle it under our Sidecar label. This Chardonnay possesses a style like Chablis – it’s got plenty of fruit and mineral characteristics. This will be a great complement, to our over-all mix of wines. The Pinot Noir from Willamette Valley arrived beautifully ripe. The signature of the 2017 Pinot Noir from Willamette Valley will be great flavor dynamics and development, with lower potential for alcohol. This will likely be a welcome break for winemakers and consumers, from the higher-alcohol vintages we’ve seen over the last few, warm growing seasons. I expect this vintage of Pinot Noir to be light on its feet and aromatically pure. The tannins are very fine, and the acidity is fresh and balanced. There will be many fans of this vintage. The grapes that we received from our southern vineyards, in the Rogue Valley and also the Applegate Valley (which is technically a sub-district of the Rogue Valley), had the potential to be affected by smoke from the forest fires. We had all of our grapes tested, and fortunately none of our grapes demonstrated any signs of smoke taint. The grapes we received from this region include: Cabernet Franc, Petite Sirah, Roussanne, Carménère, Malbec, and Cabernet Sauvignon. These grapes arrived about one week later than they did in 2016. I’m extremely excited about the wines we will make from these grapes! So far, the wine is showing itself to be full, dark, intense – demonstrating varietally classic characteristics. All of them were gloriously ripe and pure, and very intense. Carpenter Hill Vineyard Petite Sirah located in the Rogue Valley which is five miles southeast of Medford, Oregon. This vineyard has a south facing slope with 20-year-old vines and 1600 plus feet elevation. We’re currently working on a 2016 vintage of G-Force, which is a blend that we produce under our Sidecar label. Like the 2015 vintage, the 2016 vintage will include Gamay Noir, Cabernet Franc, and a small amount of Pinot Noir. Unlike the 2015 vintage, the 2016 G-Force will also include a small amount of Malbec. The Malbec should add an element of dark richness to the wine. It will spend 12 months in barrels, and I expect it to be out in the spring of 2018. We’re about to bottle a small lot of Gamay Noir, from Havlin Vineyard. It will spend 13 months in barrels. For the fall of 2018, we’re also working on a small lot of Cabernet Sauvignon. These grapes came from Serra Vineyards in Applegate Valley, and will spend a total of 20 months in barrels. Finally, we’re preparing to assemble a Bordeaux blend, which will include Carménère, Cabernet Sauvignon, Cabernet Franc, and Malbec. It will spend about 14 months in barrels. For each wine, I’ve carefully considered the influence of the time the wine will spend in oak, looking for the right time that will impart the most positive influence on the developing wine. Then, I rack the wine and put it into tanks, where it usually re-groups for about a month, before I bottle it. Serra Vineyard Cabernet Sauvignon in the Applegate Valley which is a sub-district of Rogue Valley. This vineyard has 25-year-old vines, a south facing slope, 1300 feet of elevation, and it’s surrounded by the Siskiyou Mountain range. Our 2015 Confero is now out, and it’s been very well received. We produced three Pinot Noirs in 2015, plus the Sidecar G-Force. We plan to release the 2015 Carpe Noctem, in April of 2018. Since the volume of fruit was a little lower than usual in 2015, we only have one single-vineyard Pinot Noir, from the Block B3 Old Vines Pinot Noir, from Chehalem Mountain Vineyard. It was warm and dry in Willamette Valley that year, and these grapes were the darkest hued and most intense of the 2014-2016 years. Of the three Pinot Noirs from 2015, this is the most masculine-styled wine. This vineyard is dry-farmed, with the vines dating back to 1968. Because the root system is so deep, the vines can thrive no matter what Mother Nature throws at them. This wine spent a little extra time in barrels and a little extra time in tanks, and then was bottled in June of 2017. It needed a little extra time, to truly showcase itself, and I’m quite pleased with the results. Bloom occurred mid-June in Willamette Valley, which is traditionally when we reach this milestone. The past two years were hotter than average. As a result, everything happened earlier than it typically does. So far, the fruit looks very good and there hasn’t been any frost or rain issues. Let’s hope that Mother Nature allows this trend to continue. Based on the progress I’ve seen so far on the vines, I anticipate this year’s yield will be average, or perhaps a little above average. Ideal summer temperatures, for wine grape growing, are mid-to-high 80s during the day; and we like to see a 20 to 30 degree downward shift in temps overnight. This allows the vines to rest and recharge. Overnight lows depend on where in The Valley the vineyard is located and elevated at a particular site. In Willamette Valley, we usually get ten or so days in the 90s, and occasionally it pokes above 100 degrees. Photosynthesis shuts down in the vines, once temperatures exceed 88 degrees. Prolonged heat spikes can be very detrimental, as the grape skins take a beating. This is caused by the vine being unable to protect the clusters. If skin development gets ahead of the ripening process, unbalanced wines can be the result. Just recently, I bottled the 2015 Chehalem Mountain Vineyard Pinot Noir and the 2015 Carpe Noctem- both of which I’m very excited about because they’re potentially the two best wines we’ve made to this point. I’ve included some images here in order to help demonstrate, or deconstruct, the process visually. Even after years of making wine, I find it fascinating to see how everything comes together. Both of these wines are aged in barrels from 17 to 19 months old. Then it goes in tanks for another three to four months. Additionally, they’ll both continue to age in bottles for many months, before they’re released for sale and consumption. Old Vines will be released in November of 2017; Noctem in March of 2018. I prefer to treat the upbringing of Carpe Noctem in a manner similar to a Reserva style wine, either from Spain and/or a Brunello from Italy, since it is a big, beefy Pinot Noir. I feel it warrants the extra time it takes for the wine to be ready for enjoyment when it’s released; though, it will certainly reward many years in the cellar, if one chooses to do so. The “Old Vines” process is a little different, in that it was not aged in barrels for quite as long, and I used less new wood in the aging process. These practices are still my overall philosophy for drinkability and ageability. I’m happy to announce that the Sidecar G-Force wine has been released and is now available. You may recall from last month’s Winemaker Journal, that G-Force is a blend of Gamay, Cabernet Franc, and Pinot Noir. The Gamay is sourced from a really beautiful vineyard called Havlin Vineyard, in Willamette Valley. I started by using their Gamay in this blend; but, I intend to also bottle the Gamay varietally, at some point in the future. So far, the response to the spin that we put on these varieties has been very positive. This project is about introducing people to different styles and varieties aside from Pinot Noir. And, I’m very optimistic from all the positive feedback we’ve received, about G Force thus far. Our next, immediate project will be to assemble the blend for the 2016 Confero Pinot Noir. This is the wine we consider to be our “workhorse,” and it’s a blend of a number of vineyards and clones. I expect to bottle it at the end of August. We also plan to conduct blending trials for additional upcoming Sidecar projects. For example, I’m exploring the idea of an old-school styled Bordeaux blend. This includes Carménère, Malbec, Cabernet Franc, and a small portion of Cabernet Sauvignon. The trials will involve seeing what percentages of these varieties play together best, and ultimately sing in harmony. I expect that this blending trial will be my focus for the next couple of months, prior to the start of the 2017 harvest. The 2015 Confero is now available. It will be a couple of months before this wine is available in local markets. It’s a glorious follow-up to the highly touted 2014, with slightly broader shoulders and a little more richness than its predecessor. If you like a deep, dark, savory style of Pinot, the 2015 vintage is for you! Be sure to check out our new “tasting room” inspired offerings. With these, we want to 1) Provide easy options for our guests to discover our latest releases, and compare our single vineyard selections. 2) Or, give a client a memorable gift, with one simple click. 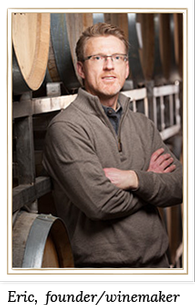 My goal is to create wines with balance, showcasing an element of restraint; I strive for an old-world style of wine. I’m not attempting to push boundaries, with the up-front personalities of the wines. I aim for my wines to be elegant, though powerful, in the same breath. Confero is always our most elegant, precocious offering. With this wine, we strive to provide an outstanding value to our audience while maintaining the highest quality standards. Carpe Noctem, our top offering, is a very strict barrel selection. It showcases the darker, more powerful side of a given vintage – where style overrides source. While certainly enjoyable upon release, it will reward a decade or more of aging in the cellar. The Philtrum Pinot Noir Blanc is an opportunity to turn heads for what can be achieved if imagination is allowed to roam freely. Though I particularly like the styles of Eola-Amity Hills, Chehalem Mountains, and Yamhill-Carlton, each one yields grapes that give different dynamics. When evaluating a new grower as a potential partner, after location, I look at clones, since there are specific that I prefer. Next, I’ll look at where they’re growing the grapes- elevation, slope, aspect- to get a sense of the general style of wine the grapes will produce. I evaluate whether they’ll farm to my specifications for quality versus quantity, in terms of yield and canopy management, etc. For me personally, it’s also important to know if my growers implement organic or sustainable practices. I really strive to work with dry farm vineyards, though many new vineyards are installing irrigation – even in Oregon. I prefer dry farming. It’s more sustainable for our environment, but it provides an element of the unknown. Each growing season in Willamette Valley brings unique potentials and challenges. That we must “adapt to whatever comes our way” is a welcome test, as a winemaker. The 2016 growing season was absolutely beautiful, in Willamette Valley. In fact, I’ve been very fortunate for the past three years: 2014 and 2015 were also beautiful, and they delivered excellent fruit. Though the weather was similar, each year’s crop had a slightly different personality. The 2014 crop was excellently pure and honest. In 2015, it was more powerful, with dark-hued fruit that I believe to be long-lived wines. Then in 2016, it was the most elegant and delicate at the outset. It now has put on considerable depth and dimension, while progressing through malolactic fermentations. These are exciting times! The 2015 single vineyard offering, from Chehalem Mountain Vineyard Old Vines, and our 2015 Carpe Noctem are in tanks waiting to be bottled. This is coming up, at the end of June. I decided to give both a couple more months longer in the barrel than normal. The boldness of the 2015 vintage demanded this. Both wines have been in the barrel for 18 months on gross lees, for the duration. This practice is quite uncommon in this day and age. This process of maturation on “gross lees” (gross lees refers to the size of the lie debris) provides a natural protection against oxidation and allows for a lower level of reliance from sulphur. They also act as a natural buffer between the wine and barrel; and, when given proper time, contribute a significant boost to the mouthfeel of the wines. This is a very “old school” technique…which we love and abhor! Of the original 18 barrels in the running for 2015 Carpe Noctem, I ultimately chose seven. Noctem is one of the most challenging vintages I’ve ever made. Because of the overall uniformity of the vintage, it really made me earn my keep to designate barrels, which I’m a head and shoulders in quality above the norm- a good problem to have, I can assure you! I’m excited to announce that I’m working on a new project here, at Aberrant Cellars. It’s a new label called Sidecar! Our first release will be a red wine called G-Force. It’s a blend, whose primary variety is Gamay, with some Cabernet Franc, and a very small percentage of Pinot Noir. I chose to work with Gamay, because there’s a great deal of interest surrounding this variety. Yet, it’s still a rarity in Willamette Valley. Cabernet Franc also has a lot of momentum, and I thought it would be fun to put them together. Cabernet Franc tends to be dominant; so, it’s taken a lot of blending trials, to get the correct blend. Gamay is bright and focused, Cabernet Franc can be dark and demanding; so I added a splash of Pinot Noir, to be used as a “silk liner.” This gives a deft touch to the wine. I’ve bottled this Sidecar in April, and I’m releasing it this June. Though it’s a different style for Aberrant Cellars, I’m very excited with the results. And, I think it will be easy to see a balance of philosophies, between Aberrant and Sidecar. Much more to be announced in regards to Sidecar in the coming months and years.